"It’s tempting to fall into the trap of comparison. Several people in my high school had better grades and test scores than me. I’d think, 'Who am I to be applying for this major scholarship? I’m not even the best in my class, so what makes me think I can win a national award?' I wrestled with self-doubt. But don’t let the competition discourage you." The numbers could terrify any prospective college student: More than $1.5 trillion in student debt nationwide, with an average 2018 graduate owing $29,800. But take a deep breath. Scholarships and grants can chip away at those numbers―and potentially erase them. Kristina Ellis did just that. By securing more than $500,000 in scholarships, the Nashville resident paid her way through undergrad and graduate school at Vanderbilt and Belmont universities. So how did she do it, and what advice does she have for the rest of us? We sat down with her to find out. Grow: How did your scholarship journey begin? Kristina Ellis: The first day of my freshman year of high school, my mom let me know I’d be on my own [financially] once I graduated, and I needed to start thinking about college. It was hard to choke down, but I soon realized she was trying to help. She encouraged me to learn about scholarships and start building my resume. The more I started learning about the possibilities, the more motivated I became. It’s a daunting process. How did you start? I began by getting informed. I read books, interviewed alumni from my high school who’d been successful, talked to a financial aid officer at our local college, and did anything I could to learn. Then I hit the application process hard senior year. I treated it as a part-time job, often putting in 20 to 30 hours per week. I figured if I spent two hours applying for a scholarship and won $500, that was like making $250 per hour, which was a heck of a lot more than I was making at my job at the YMCA. At what point did you start seeing some success? 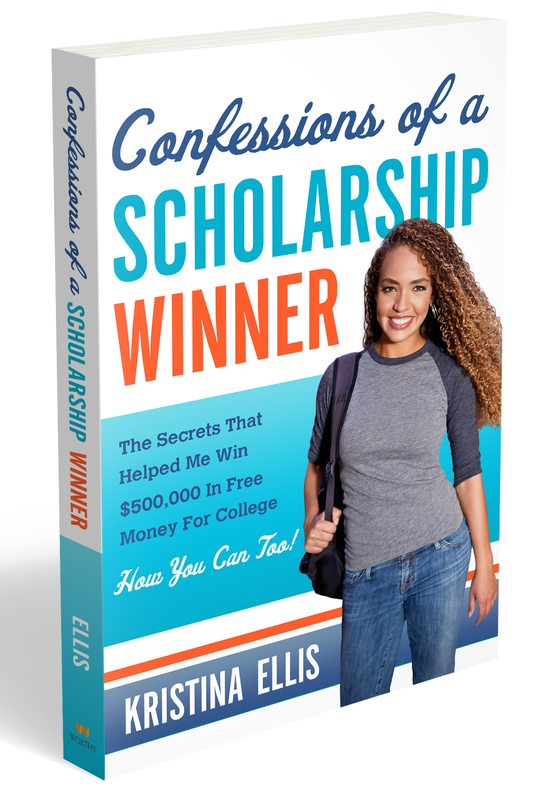 It was nerve-wracking at first, because I was putting in hours and hours in the application process before having any validation that I had what it takes to win any scholarship money. It got easier as time went on, as I learned that I could “recycle” several of my scholarship essays. Once I had a few strong applications and essays, I had material I could adjust for future ones. Which organizations were the biggest factors in your getting to $500K? The biggest scholarship I won was The Gates Scholarship, which paid for anything outside of what I received in financial aid, up to the cost of attendance and through a Ph.D. The Coca-Cola Scholars Program Scholarship, the Horatio Alger Scholarship, and the U.S. Presidential Freedom Scholarship also made significant contributions. Some scholarships depend on personal essays. Any tips that you found useful? Little details are huge. Your content may be fantastic and your story engaging, but spelling errors, incorrect punctuation, and awkward wording can stand between you and a $50,000 award. There were several times when I thought my application was ready…and then I realized in my “final” review that I had left a line blank or a period was missing. Careless mistakes can send red flags to scholarship committees, signaling a lack of commitment or plain laziness. How did you figure out spending plans? With most of the scholarships, I could only use them up to the COA, or cost of attendance—the full and reasonable amount a school estimates it should take to attend their institution. It includes things like housing, a meal plan, and a personal allowance. I couldn’t just pocket extra scholarship money. I think that’s something that confuses people sometimes when I say I won $500,000 in scholarship money. They think perhaps I went out and bought a car or something, but that’s not how it works. Any money I didn’t spend stayed with the scholarship programs. What resources would you recommend to high school seniors? Online databases such as Cappex.com and Unigo.com help narrow your search. Results are generated that align with your background, interests, and attributes. Most of the databases provide detailed information about scholarship programs and links to their applications. There are also some great apps. If you watch “Shark Tank,” you may have heard about Scholly, a great online database for your smartphone. Books such as “The Ultimate Scholarship Book” by Gen and Kelly Tanabe are packed with information that could bring in thousands of dollars. Most high schools have scholarship resources. First and foremost is your school counselor, the point person for scholarship programs seeking to reach students at your school. Alumni can be a great resource too. Ask your counselor or teachers for the names of students who won significant amounts of award money. Reach out and ask if they’d be willing to share some keys to success. More often than not, alumni are excited to let up-and-coming scholarship seekers in on their strategies. It’s tempting to fall into the trap of comparison. Several people in my high school had better grades and test scores than me. I’d think, “Who am I to be applying for this major scholarship? I’m not even the best in my class, so what makes me think I can win a national award?” I wrestled with self-doubt. But don’t let the competition discourage you.